When a book has a cover and title as beautiful as Iron Hearted Violet by Kelly Barnhill, it is almost impossible to resist. Add to that a story promising dragons, adventure and the end of the world, and the lure is impossible to resist. This title has been on my wishlist ever since a Waiting on Wednesday post last June. Middle Grade March seemed like the perfect time to finally read about the unusual princess Violet and the myth that changes her life. Violet is (as I said) an unusual princess. She is preternaturally intelligent, ugly, obsessed with stories, and has exactly one friend. She (accompanied by that friend, Demetrius) has been exploring her father’s castle top-to-bottom since she was quite young, and over time has found several curious things. One of those things is a myth or a legend – but it’s not just any sort of myth. It’s a story with the power to change, to destroy, and to undo everything Violet knows. It’s a good thing that Violet has help, for surviving this challenge is beyond her. It requires a team of feisty characters blessed with courage and cleverness and love. 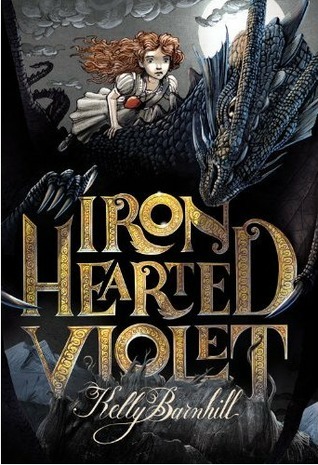 Iron Hearted Violet is an attempt to turn the fairy tale genre upside down, and in some ways it succeeds marvelously. There are hints of familiar tales throughout, but Violet herself is never the typical princess (she reminded me a bit of a mash-up of Ginny Weasley and Hermione Granger from the Harry Potter series, to be honest). Violet deals with expectations and traditions in a believable way, while making her own decisions and learning to bravely face the consequences in order to set things right. There’s never a sense of safety in this story – it examines loss, deception, obsession, and the danger in believing that you know what is best for everyone else. In addition, the mythology of the mirrored world is original and well-developed. I also appreciated the beautiful illustrations by Iacopo Bruno. As his artwork was what brought me to the story to begin with, I was happy to see sketches throughout that added to the story’s quality. Having said all of that, Iron Hearted Violet landed flat. I hoped it would have charm akin to Valente’s Fairyland books or Joanne Harris’ Runemarks, but in that I was disappointed. The book suffered from a stilted point of view perspective (the tale is narrated by the adult castle storyteller), an over-long story (tightening the plot wouldn’t have gone amiss), and a deficiency of character development in anyone except Violet (especially noticeable in regards to Demetrius and the dragon). In sum, while Iron Hearted Violet was delightful in flashes, the overall effect was leaden and ponderous. Recommended for: fans of Cornelia Funke’s Inkheart and Mike Wilks’ Mirrorscape, those who like adventures featuring the end of the world, and anyone with a penchant for stories within stories and unique mythology. My library has this one and I've considered getting it, but I may push it down the list. Runemarks, however, is high on that list. I have a copy of this one on my shelf and I'm really sad to hear it fell flat. It does sound like a kind of fun read though so I think I may still give it a shot. Great review! Bummer. It sounded so good. And a G&H mix sounds fantastic. But thank you for your honest review. Ugh, this is EXACTLY how I felt about this book. It took me so long to finish because the narrative structure kept you so far removed. I kind of understood what she was going for - a traditional storyteller vibe, but it just didn't work. Hmm...I've actually had this one since BEA last year, but something keeps me from picking it up even though everything about the first half of your review makes me want to (fairy tales turned upside down, sense of danger, Ginny/Hermione mashup). I'm really disappointed to hear that it falls so flat, but alas, the PoV and lack of ancillary character development will likely bother me as they did you. I'll likely still give it a try at some point, but I'll be ready to jump ship if I can't get into it. Your comment on how a book can have a beautiful-sounding title made me start wondering, yes, what is it about those three words--"iron," "heart," and "violet"--that makes our bookworm antennae perk up? I'm sorry to hear that the book fell flat though. It's not what I would've liked to hear about such a gorgeous-looking book, but looks aren't everything. I love that title, it's a shame the book was blah. I enjoyed this one, but agree, it felt a little flat at times because of the narration by an adult. Not a great read, but definitely an enjoyable one. Atypical princess stories are becoming, well...typical! Sometimes the smart-and-plain princess is excellent, and sometimes ordinary princesses turn out to be very dull in their ordinariness. Sounds like this one has some potential, and I'm intrigued by the story-with-power aspect...too bad it fell flat!